Mike Ullery/Civitas Media Greenville’s A.J. Frens clears the bar in the pole vault at the Division I state track and field meet Saturday at Jesse Owens Stadium in Columbus. COLUMBUS — A.J. Frens was hoping to use his trip to state as a launching pad for even greater successes in the future. He forgot to leave much room for improvement — not that he minds. The Greenville sophomore, who burst onto the scene this year in style thanks to a record-setting performance at the Greater Western Ohio Conference meet, cemented his place among the top pole vaulters in the state Saturday, earning a spot on the podium by placing fifth at the Division I state track and field meet at Jesse Owens Memorial Stadium in Columbus. He was very close to having his best day yet. Frens cleared 15-0, putting him within striking range of his GWOC-record mark and personal best of 15-3. The road there wasn’t necessarily a smooth one, though. After coming in at 13-6 and clearing his first two jumps easily, Frens missed at 14-6 — and then he narrowly missed again, and with 10 vaulters still in at that height, he was down to one last chance to keep his podium hopes alive. Frens cleared 14-6 to stay alive, and seven vaulters remained at 15-0, ensuring him a medal in his first trip to state. The only question left was how high on the podium he’d end up. He missed his first shot at 15-0 and clipped the bar on his second attempt. 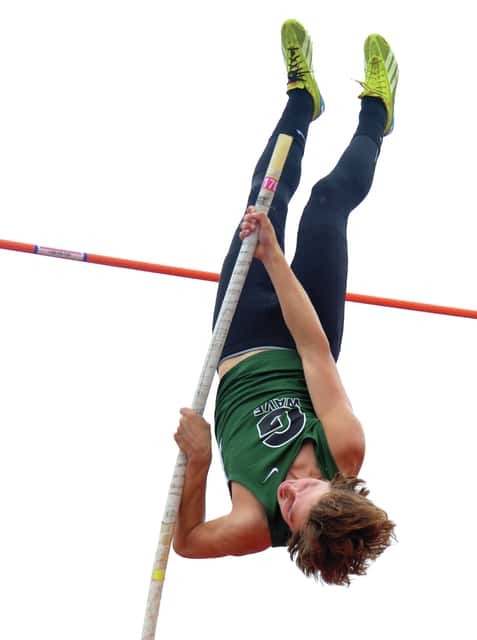 The bar wobbled, but it didn’t fall — and Frens and four other vaulters advanced to 15-4. “I was just hoping it didn’t fall, and I got lucky enough,” Frens said. Both he and Austintown-Fitch’s Dylan Latone fell out of the competition at 15-4. Latone hadn’t missed until that height, though, taking fourth. Hoover’s Matt Peare won by clearing 16-4, Massilon Perry’s Lucas Kelley was second, clearing 16-0, and Berea-Midpark’s Matt Owens was third, clearing 15-4. And while he may not have left much room to move up, he and the rest of the Green Wave vaulters are still looking forward to getting back to work.